A few weeks ago I received an unexpected package in the mail from Lana’s The Little House. Worried that I might be tea shopping in my sleep, I opened the box with a bit of trepidation. What I found inside was a lovely note from Lana herself. Apparently when I reviewed my previous order I had noted that one of the samples I received was fairly light. Now I have gone back and looked carefully at the current site and there doesn’t seem to be a defined amount for the sample size, so I guess I must have been comparing that particular sample to the other one that I ordered and also reviewed. Regardless, this surprise package contained a note from Lana apologizing for the small size of the sample and as well as a few other samples of her tea to try. I don’t think an apology was necessary, but I appreciate the thought and thank Lana for her excellent customer service. 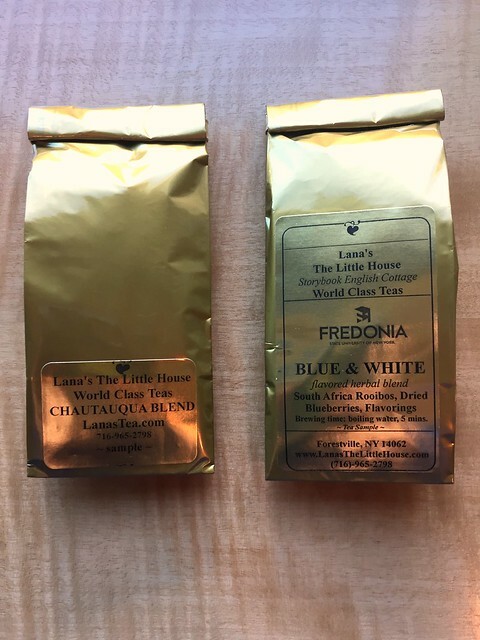 I received two teas in this package: Fredonia Blue & White and Chautauqua Blend. Today I’ve chosen to review the latter. Chautauqua Blend contains black tea with a combination of strawberry bits, raspberry bits, orange peels, and other fruit flavors. It is available in a variety of sizes including 4oz for $12.00 and sample size for $3.oo. When I opened the package I smelled the berry flavor and it reminded me of summer. Once brewed I got more of the black tea aroma, but it still smelled like summer fruits. The tea was smooth with just a hint of sweet. It was delightful as an afternoon cup of tea, but I also think it would be wonderful iced in the summer months. Again, I would like to thank Lana for her thoughtful package and I encourage you to try some of her offerings (including her Snowflake Tea which I love!). Next The Corner of Knit & Tea: Episode 110, Chilly Today.